Several hundred pigs at Fair Oaks Farm Pig Adventure. This working farm CAFO doubles as an education and learning center for the public. Robin Bartholomew has lived all of her life in and around Valparaiso, Ind., about an hour east of Chicago. Much of that time has been around farms. “As I was growing up, there were some hog farms and cattle, just the typical family farm grazing, open air,” Bartholomew said. But when a local family recently proposed a farm to house up to 6,000 pig farm, Bartholomew was outraged. The proposed facility would’ve sat a few hundred yards from homes and about a mile from Valparaiso’s bustling downtown shopping district. Bartholomew worried about not just the smell, but the potential impact to groundwater. The farmers, Robert and Tammy Sands, wanted a zoning change to run a concentrated animal feeding operation, or CAFO for short. There are around 1,800 of these large-scale livestock operations in Indiana, according to the Indiana Department of Environmental Management. Some house chickens, cows and, of course, pigs. “Because we are in a state that has a lot of wide open spaces, without a lot of people in certain areas, this is just a great state to raise livestock,” said Malcolm De Kryger, a longtime pig farmer. “Our state government has shown that it has been a great economic developer for rural areas." De Kryger is president of Belstra Milling Company of DeMotte, Ind. 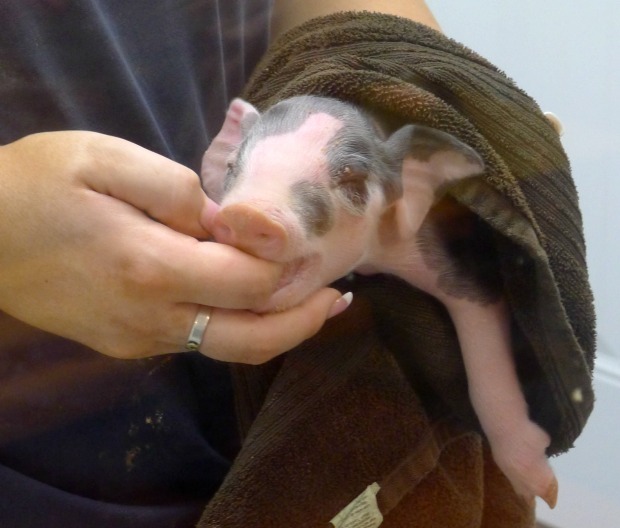 The company breeds up to 400,000 baby pigs annually at his six operations located in both Indiana and Illinois. About 90 minutes south of Chicago De Kryger also operates the Pig Adventure at Fair Oaks Farm, which doubles as a learning center and tourist attraction for the public. At Pig Adventure, which is a full-fledged CAFO, there are rows and rows of pigs in a giant warehouse and a nursery where hundreds of piglets are born every day. “They poop, they play and they sleep. That’s their life,” De Kryger said on a recent day outside the pig farm CAFO, which houses about 2,500 pigs. About one-third of De Kryger’s piglets wind up at other farms to continue growing and well, eventually become bacon. Many of them were set to be transported to the controversial hog farm outside Valpo. But now, that’s not going to happen. After a month of vocal opposition, much of it on social media, the Sands family said last week that they were dropping the idea altogether. Many Valpo residents cheered the news. But the decision raises the question of how livestock farms can exist alongside growing Hoosier cities. “The vitriol that was thrown at them because they were trying to figure out how to enhance their family operation was pretty sad,” De Kryger said. De Kryger sympathizes with the Sands family because it’s harder nowadays to make a living on a small farm. He says the Sands Family wanted to be part of Indiana’s growing 3-billion dollar pork industry. De Kryger disputed claims that the proposed facility would have lowered property values or damaged the environment. 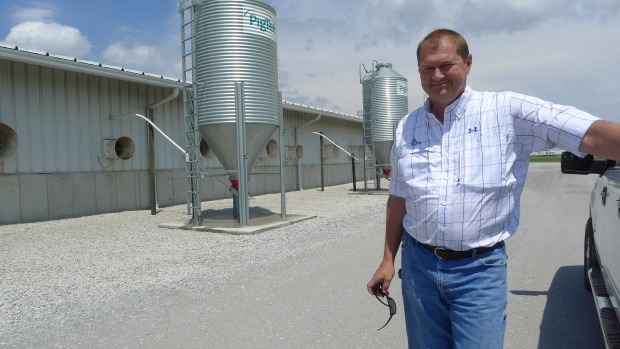 And he says odors at concentrated animal feeding operations are barely noticeable — although the manure is often used as fertilizer for adjacent crops. Slipher says activists opposing a farm expansion is nothing new in Indiana, but the strong public outcry that happened in Valparaiso was unusual. Especially since the Sands family had long ties to the community. The Sands Family declined to comment for this story, but last week released a statement. But other groups like the Hoosier Environmental Council, applauded the decision by the Sands. “This is great news for the hundreds of families who would have been living dangerously close to the hog factory — families who rely on groundwater wells for drinking water and for everyone who enjoys Valparaiso’s newly revitalized downtown area — an area that would have been down wind of 7,000 hogs and their waste,” the HEC said in a statement. But not all who opposed the pig farm were activists. Some were powerful politicians. Costas says he’d support another location if it were further away. But for residents like Robin Bartholomew, these kind of intense-use livestock farms will never be welcome anywhere in Porter County. There are 4,000 pigs at a large CAFO just 10 miles south of Valpo that’s been in operation for years — without raising much of a stink. Michael Puente is WBEZ’s Northwest Indiana Bureau Reporter. Following him @MikePuenteNews.